Hippocrates described an array of facial injuries as long ago as 400 BCE. During the early 20th century, Sir Harold Gilles, father of plastic surgery, taught army personnel about breathing problems in patients with facial injuries and to place them supine to maintain an airway. René Le Fort described 3 basic types of fractures. Endotracheal anesthesia and radiography developed during the First World War led to a better understanding and treatment of facial fractures. During the Second World War, a multidisciplinary approach to treatment of facial fractures continued to improve the outcomes of severely injured soldiers. Advent of CT reconstruction of facial bones, along with new surgical techniques, has dramatically improved the final appearance patients who have sustained bony injuries. 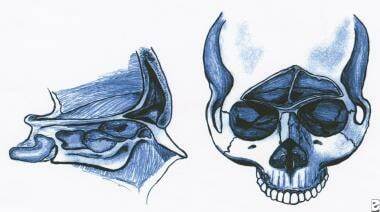 Anterior and lateral views of the frontal sinus. These figures demonstrate the relative thickness of the anterior and posterior tables, as well as the relationship of the frontal sinus to the orbits, ethmoid sinuses, and anterior cranial fossa. The ype of object striking the face and force behind the object are the main determinants of whether a person sustains soft-tissue or bony injury. In automobile accidents, striking a hard dashboard is more likely to cause bony injury than striking a padded dashboard or an airbag. Striking the steering wheel concentrates the force more than striking the flat surface of the dashboard. This also holds true for altercations with a bat, as compared to a bare fist or boxing glove. Penetrating injury from a shot gun at a distance is not likely to cause fractures. Bullets from low-velocity guns are likely to cause fractures; high-velocity bullets cause fractures and extensive soft-tissue damage. The amount of force needed to fracture different bones of the face has been studied; injuries have been divided into those that require high impact to fracture (greater than 50 times the force of gravity [g]) and those that require a low impact to fracture (50 g or less). Approximately 3 million facial injuries occur annually; however, most do not involve maxillofacial fractures. [10, 11, 12, 13, 14, 1, 2] One study placed the incidence of severe maxillofacial injury (fractures and lacerations) at 0.04-0.09% for persons in motor vehicle accidents. Incidence of fractures due to motor vehicle injuries is higher in rural areas, and altercation-related fractures are more frequent in urban areas. Incidence of other major injuries is as high as 50% in high-impact fractures, while it is 21% for low-impact fractures. Motor vehicle accidents are more likely than violent altercations to cause other injuries. Mortality rate in high-impact fractures is as high as 12%, yet deaths rarely occur from maxillofacial injury. The incidence of cervical spine injuries associated with frontal fractures has been reported in the 0.2-6.0% range. Adult male-to-female ratio is 3:1. Consider domestic violence in women with facial injuries not related to a motor vehicle crash. Male predominance is reduced to 2:1 in children. Consider child abuse when facial injuries are found in children. Hasan N, Colucciello SA. Maxillofacial trauma. Tintinalli JE, Gabor KD, Stapczynski SJ, eds. Emergency Medicine: A Comprehensive Study Guide. 6th ed. McGraw-Hill Co Inc; 2004. chap 257, p1583-1590. McKay MP. Facial trauma. Marx JA, Hockberger RS, Walls RM, eds. Rosen's Emergency Medicine, Concepts and Clinical Practice. 6th ed. Philadelphia, PA: Mosby Elsevier; 2006. Vol 1: 382-98/chap 39. Kummoona RK. Missile War Injuries of the Face. J Craniofac Surg. 2011 Nov 5. [Medline]. Hoppe IC, Kordahi AM, Paik AM, Lee ES, Granick MS. Examination of life-threatening injuries in 431 pediatric facial fractures at a level 1 trauma center. J Craniofac Surg. 2014 Sep. 25(5):1825-8. [Medline]. Hasheminia D, Kalantar Motamedi MR, Hashemzehi H, Nazeri R, Movahedian B. A 7-year study of 1,278 patients with maxillofacial trauma and cerebrospinal fluid leak. J Maxillofac Oral Surg. 2015 Jun. 14 (2):258-62. [Medline]. Vu AT, Patel PA, Chen W, Wilkening MW, Gordon CB. Pediatric frontal sinus fractures: outcomes and treatment algorithm. J Craniofac Surg. 2015 May. 26 (3):776-81. [Medline]. Peltola EM, Koivikko MP, Koskinen SK. The spectrum of facial fractures in motor vehicle accidents: an MDCT study of 374 patients. Emerg Radiol. 2014 Apr. 21 (2):165-71. [Medline]. Coppola S, Froio S, Merli G, Chiumello D. Maxillofacial trauma in the emergency department: pearls and pitfalls in airway management. Minerva Anestesiol. 2015 Dec. 81 (12):1346-58. [Medline]. Muminagic S, Masic T, Babajic E, Asotic M. Managment of frontal sinus fracture: obliteration sinus with cancellous bone graft. Med Arh. 2011. 65(4):250-1. [Medline]. Hendler BH, Rosen P. Maxillofacial trauma. Rosen P, ed. Emergency Medicine: Concepts and Clinical Practice. Mosby-Year Book; 1998. 1093-1103. McGill J, Ling L, Taylor P. Facial trauma. Diagnostic Radiology in Emergency Medicine. Mosby-Year Book; 1992. 51-76. Smith RG. Maxillofacial injuries. Harwood-Nuss A, ed. The Clinical Practice of Emergency Medicine. Lippincott Williams & Wilkins Publishers; 1991. 337-43. Sullivan W. Trauma to the face. Wilson RF, Walt AJ, eds. Management of Trauma: Pitfalls and Practice. Lippincott, Williams & Wilkins; 1996. 242-69. Thomas SH, Shepherd SM. Maxillofacial injuries. Harwood-Nuss A, ed. The Clinical Practice of Emergency Medicine. Lippincott, Williams & Wilkins; 1996. 408-18. Bellamy JL, Mundinger GS, Flores JM, Reddy SK, Mithani SK, Rodriguez ED, et al. Facial fractures of the upper craniofacial skeleton predict mortality and occult intracranial injury after blunt trauma: an analysis. J Craniofac Surg. 2013 Nov. 24(6):1922-6. [Medline]. Kolodziej MA, Koblitz S, Nimsky C, Hellwig D. Mechanisms and consequences of head injuries in soccer: a study of 451 patients. Neurosurg Focus. 2011 Nov. 31(5):E1. [Medline]. Guo L, Guo W, Li R, Sheng L, Yang B, Tang W, et al. Analysis of maxillofacial injuries caused by the 2010 Yushu earthquake in China. Emerg Med J. 2011 Oct 13. [Medline]. Spoor T, Ramocki JM, Kwito GM. Ocular trauma. Wilson RF, Walt AJ, eds. Management of Trauma: Pitfalls and Practice. Lippincott, Williams & Wilkins; 1996. 225-41. Bellamy JL, Molendijk J, Reddy SK, Flores JM, Mundinger GS, Manson PN, et al. Severe infectious complications following frontal sinus fracture: the impact of operative delay and perioperative antibiotic use. Plast Reconstr Surg. 2013 Jul. 132(1):154-62. [Medline].